The degradation of concrete under water is a serious and troublesome matter. Underwater concreting is necessarily adopted in marine works and in deep foundations. Due to the continuous loss of cement and segregation of concrete, placing of concrete under water becomes very difficult to unreinforced construction. 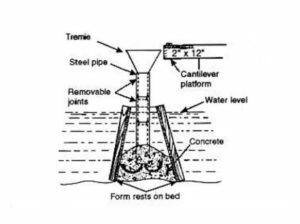 Today I am going to discuss tremie method that is mostly adopted for concreting under water such as cofferdams, caissons, and such other dewatering method. Tremie method is one of the most common methods that is used for concreting under water. In this method, a long steel pipe (named as tremie) having a diameter of 15 to 30 cm is inserted vertically into the water. The pipe should be long enough that it reaches to the bed of water keeping its one end above the water level. The tremie is then fitted with a hopper at the upper end for pouring concrete inside the pipe. 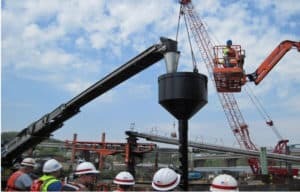 The lower end of the tremie pipe must be closed with a check valve before inserting it into the water. After that, freshly mixed concrete is poured with the help of hopper. When the concrete is poured, it displaces the air and water present in the pipe and finally reaches to the bed. During the time of concreting the tremie is continuously lifted keeping the lower end of the tube in the concrete that is already poured. To reduce the extra loss of cement under water, rich concrete mix should be always used. Thus concrete laid underwater should never be compacted or consolidated. ALSO READ – Raft Foundation Or Mat Foundation Construction.